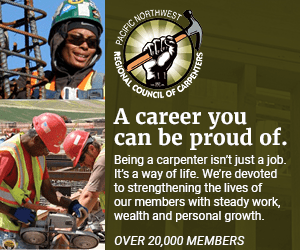 In last year's publication of The Skanner's Minority Business Enterprise special edition, we highlighted the efforts of construction contractors in the Seattle area to overcome the damage to their business caused by Washington's anti-quota law. Today, while top-tier companies such as Fred Anderson's Leajak Concrete Construction have won contracts on the multi-billion dollar Brightwater wastewater plant, there is significant room for improvement in minority opportunities in the field. "The way the economic climate is for us right now, it's very difficult for us to go out and compete against bigger companies that can go out and bid the jobs, companies that can afford to keep the people busy because they have the cash in reserve," Anderson said. "They don't have to bid a job to make a margin. They can bid a job just to make sure they're working." Leajak is a structural concrete company specializing in seismic retrofits, and structural concrete work in general. Anderson started doing concrete work in his high school years, working for a small concrete company, then a sand and gravel gradient company. In college, he worked as a carpenter. After college he went into professional football, playing defensive lineman for the Pittsburgh Steelers and Seattle Seahawks. "In my first two seasons during the off-season I worked in construction, I worked for Hoffman down in Portland," Anderson said. "I was looking for something where I could control my own destiny and it's an area where I had a fair amount of experience and I just thought I would give it a go." Since opening his doors in 1992, Anderson has won contracts from Sound Transit to King County, the African American Museum, and Garfield High School. The biggest job his company has won so far is their current $5.5 million subcontract with Kiewit, working on the pump station at Brightwater. "We do some highway work, we've been working toward getting into some more highway work," Anderson says. Yet he says he has mixed feelings about the industry right now. "We have to bid jobs, we have to make money as small minority contractors — and that's the most difficult part right now," he says. "It's very hard for us to participate even as a prime because of bonding — having a sufficient line of credit. Also, Anderson says that the years of overt discrimination in the field that held back viable minority-owned firms has allowed others to amass significant qualifications with less competition. "We're still struggling up here with that, and it's a problem," he said. The economy has only made the entire situation worse for entrepreneurs. "I'd say really do your research and make sure it's something you really want to do," he says. "Because there are going to be peaks and valleys and there are probably going to be more valleys than peaks."